We love hearing and sharing the ways that families have benefitted from our foundation. Through donations of all sizes, we are able to provide children with therapy, specialized equipment, and a network of support. Please take the time to read some of the amazing stories submitted by families. We promise, they will warm your heart and put a smile on your face. If you have a story to share, please tell us about it! 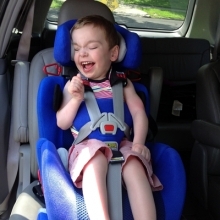 Back in the Fall of 2013, Lexi’s Closet donated a Rifton Gait Trainer to a 2 year old child named Brooke, who was enrolled in an Early Head Start program. 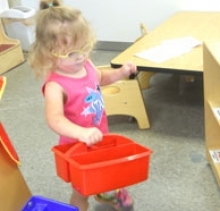 She was diagnosed with cerebral palsy and developmental delays, and was not able to crawl or walk on her own yet. 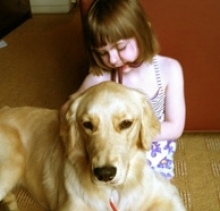 Ally and her service dog, Perry, are new best friends. Grant money from our foundation helped purchase Perry, who can detect and alert others of Ally's upcoming seizures. Perry can do some other pretty amazing stuff...read on to see how she keeps Ally safe! Brennan was diagnosed with Tay-Sachs Disease, which can result in loss of motor skills, seizures, blindness, deafness and death. His previous stroller did not provide enough support for him to attend his many doctor visits. Conlan was born with a condition that prevents him from speaking, but his smile says it all. See why this happy tot is grinning ear to ear.